I was writing earlier this morning about the Victorian writer Georgiana Lady Chatterton (1806-1876), her travelogues about pre-Famine Ireland, her unusual marriage arrangements after she moved from Cork to England, and her decision to become a Roman Catholic, through the influence of Cardinal Newman, only weeks before her death. Today, she is largely forgotten as an Irish writer. So, what about Lady Chatterton’s literary legacy? What happened to the Ferrers family, into which her niece Rebecca married? And whatever happened to Castlemahon, the former Chatterton family home in Blackrock, Cork? Between 1836 and 1875, Lady Chatterton wrote numerous romantic novels, poems, biographies, religious tracts and travel books. Her string of romantic ‘novels’ were consumed eagerly by her female readers, but they were nothing less than turgid fiction, and were reviled and derided by literary critics. ‘Thank you for your translations of Aristotle. They are well selected, clear, and good, and must have involved a good deal of trouble. But it must have been pleasant trouble. ‘I fear you must have suffered from this trying season – which is not yet over. ‘With my best remembrances to the family circle at Baddesley. But it has been said without cruelty by literary critics recently that her writing style did for prose what William McGonagall did for poetry. As for Marmion Ferrers and his family and his name, people were still fighting over the Ferrers name and title 30 years after his death, as late as 1914, when the case again came before the House of Lords. In 1855, Marmion Ferrers became one of the legal heirs to the title of Baron Ferrers of Chartley. This title went into abeyance with the death of his uncle that year, and the two claimants were Marmion and his aunt, Lady Elizabeth Boultbee. Marmion’s mother was Lady Elizabeth’s sister, Lady Harriet Anne Townshend (1782-1845), who married Edward Ferrers (1790-1830) in 1813. The two sisters became the legal heirs to their brother, George Townshend (1778-1855), 3rd Marquess Townshend. The Ferrers title had been inherited in the Devereux family by the Earls of Essex. 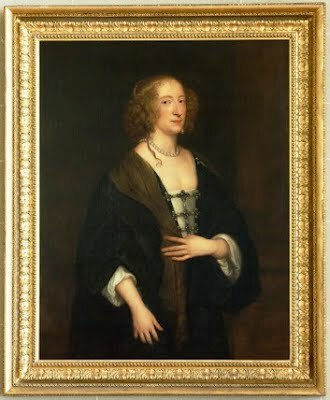 Robert Devereux, 3rd Earl of Essex and Lord of the Manor of Lichfield, had two sisters, Lady Frances Devereux (1590-1674), who in 1616 married William Seymour (1587-1660), later Duke of Somerset; and Lady Dorothy Devereux, who married Sir Henry Shirley, whose descendants held the titles of Earl Shirley and Viscount Tamworth. The Ferrers title was called out of abeyance in favour of Lady Dorothy’s grandson, Sir Robert Shirley, who was made 1st Earl Shirley and was also recognised as the 13th Baron Ferrers of Chartley. While the title of Viscount Tamworth remained in the Shirley family, the Ferrers title and Tamworth Castle descended to his granddaughter Lady Elizabeth (Shirley) Compton (1694-1741), Countess of Northampton. Her only child, Lady Charlotte Compton, was recognised as Baroness Ferrers of Chartley. Charlotte married George Townshend (1724-1807), the 1st Marquess Townshend. 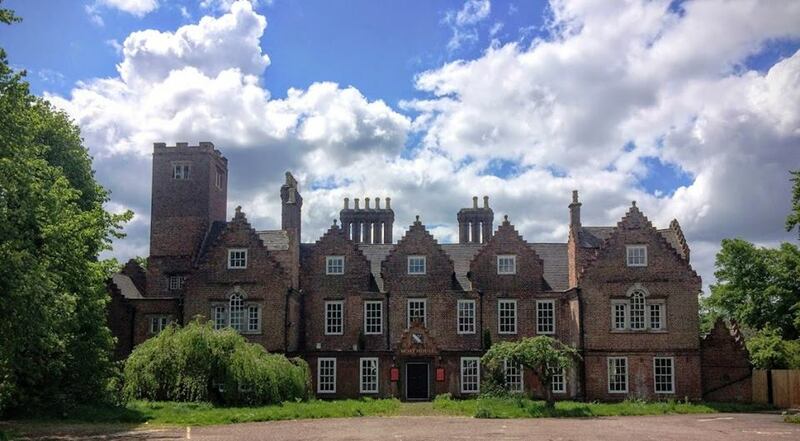 When the Townshend family came to live at Tamworth Castle in 1767, they also bought the Moat House, the former Comberford family Tudor Gothic house on Lichfield Street, Tamworth. Lord Townshend was Viceroy of Ireland (1767-1772) and gave his name to Townsend (sic) Street, Dublin, originally known as Lazer’s Hill. when Charlotte died in Dublin on 14 December 1770, the Ferrers title was subsumed in the Townshend titles until 1855 and the death of her grandson George, 3rd Marquess, who had a nephew and a sister as his co-heirs. His sister, Lady Harriett Ferrers, married a distant cousin, Edward Ferrers (1790-1830) of Baddesley Clinton, who was descended from the Lords Ferrers of Groby. George Townshend had owned both Tamworth Castle and the Moat House on Lichfield Street. But he dissipated his fortune and estates and found himself at the centre of a long-running scandal when his wife, Sarah Dunn-Gardner, ran off with a brewer John Margetts and married him bigamously in Gretna Green in 1809. They had several children who assumed the Townshend name, and their eldest son, John Townshend (1811-1903), assumed the title of Earl of Leicester. Eventually, Sarah’s children dropped their claims, and Townshend’s brother, Lord Charles Vere Ferrers Townshend (1785-1853), bought back Tamworth Castle in 1833. But the family never recovered the Moat House, and for the rest of his life George Townshend lived in exile in Italy, where he died in Genoa on 31 December 1855 at the age of 77. Meanwhile, his brother Charles had died in 1853, and the claim to the Ferrers title passed to his sister and his nephew. Marmion Ferrers died in 1884, and he and Rebecca had no children. All his brothers had also died without surviving sons – including Groby Thomas Ferrers, Compton Gerard Ferrers and Tamworth George Ferrers – save one brother, Charles John Ferrers, who had died in 1873. 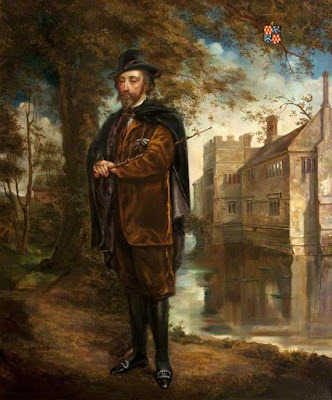 Charles had lived in England with his mother, brothers and sisters at Baddesley Clinton Hall until about 1840, when he moved to Hampton Lodge near Warwick. He had an affair with a young woman, Sarah Pittaway, who had once been a servant in his mother’s home. They had several children, and in 1850 Charles moved the entire family across the Atlantic to Bremen in Cook County, Illinois. But Charles never married Sarah and he died on 3 February 1873 in Illinois, leaving five sons and three daughters, two of whom had been born in Warwick before the family left England. Those two had been baptised and named Pittaway rather than Ferrers, with no father’s name on their birth certificates. Ever since, the Ferrers title has remained in abeyance, and the family tree and the descent of Basseley Hall by marriage and through distant relatives of the Ferrers family are so difficult to disentangle that it is unlikely that a claimant would ever emerge. 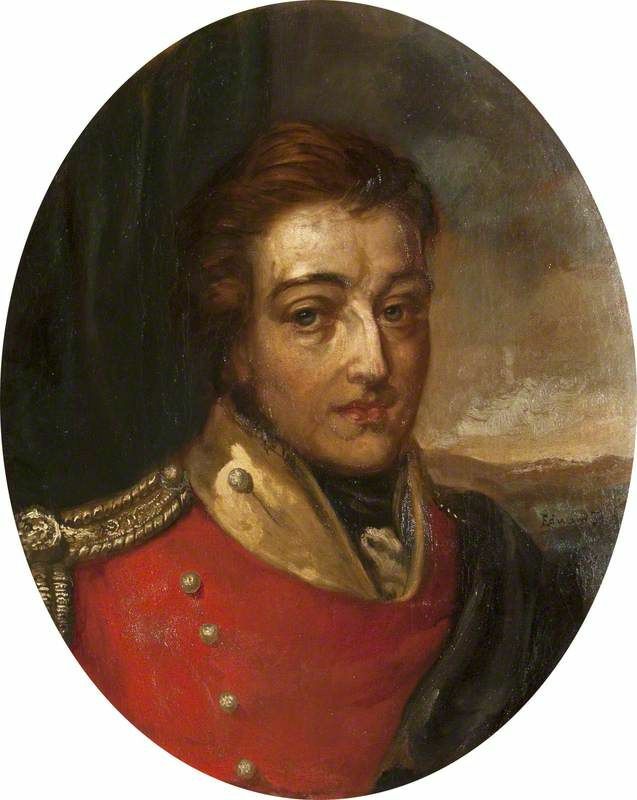 As for the Chatterton family, when Georgian’s first husband, Sir William, died in 1855, the title of baronet passed to his brother, General Sir James Chatterton (1794-1868). General Sir James Charles Chatterton was born in 1794 and entered the British Army in 1809 as a cornet, the fifth grade of commissioned officer in a cavalry group who carried the colours. He fought in the Peninsular War, at the Battles of Quatre Bras and Waterloo and in France during the advance on Paris. Sir James bore a banner at the Duke of Wellington’s funeral, having risen to the rank of General. He commanded the 4th Dragoon Guards from 1831 to 1848. He was then MP for Cork (1849-1852) and High Sheriff of Co Cork (1851). He was Colonel of his regiment from 22 November 1868 until his death in January 1874. He is buried in Plot 40, Brookwood Cemetery, Surrey. A window was erected in his memory in Saint Fin Barre's Cathedral, Cork. When Sir James died, the Chatterton family title died out too, but members of the extended family continued to be involved in public life. Hedges Eyre Chatterton (1819-1910), a second cousin of Rebecca Orpen, was Conservative MP for Dublin University, Solicitor-General and then Attorney-General of Ireland, and later Vice-Chancellor of Ireland. He is remembered for his ill-advised attempt to thwart Dublin Corporation’s decision to change the name of Sackville Street to O’Connell Street. Dublin Corporation voted for the name change in 1885, but it aroused considerable objections from local residents, and one resident sought an injunction. Chatterton granted the injunction on the grounds that the corporation had exceeded its statutory powers. Rather unwisely, though, he also attacked the merits of the decision, accusing the Corporation of ‘sentimental notions.’ Dublin Corporation was angered by both the decision and the criticisms, and in what was seen as an insult to the judge, Temple Street, then frequented by prostitutes, was briefly renamed Chatterton Street. The controversy was short-lived: Dublin Corporation was granted the necessary powers in 1890. By the time the new name had become official in 1924, it had gained popular acceptance. Hedges Chatterton was an uncle of the Cork-born missionary Eyre Chatterton (1863-1950). He was born in Monkstown, Co Cork, and headed the Dublin University Mission to Chhota Nagpur (1891-1900) before becoming the first Bishop of Nagpur (1902-1925) in India. Castlemahon, the Chatterton family’s former home on Castle Road, near Blackrock Castle, had been known until the late 1700s as Tarkfield. Dating from 1798, it was owned by Sir James Chatterton, the 1st Baronet, and passed to subsequent generations of the Chatterton family. In the mid-20th century, Castlemahon was owned by the Irish golfer Jimmy Bruen, winner of the British Open in the 1940s, who was given the house by his parents as a wedding present. It stopped being a private residence in 1985 when it was bought by Maura and Kevin Whelan, who ran a 16-room nursing home there until 2006. It was then placed on market, along with 1.75 acres. 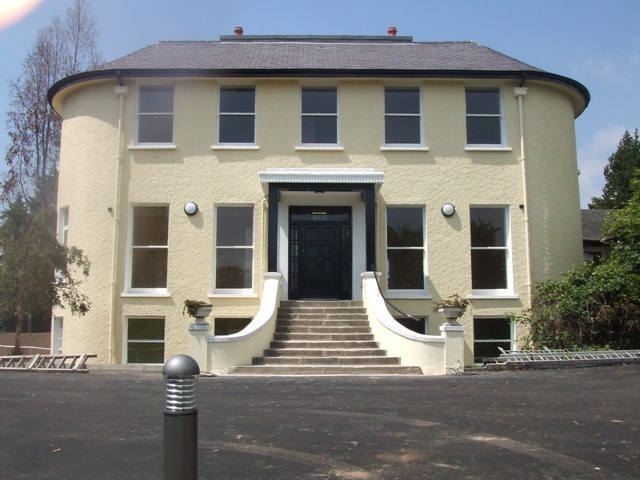 Castlemahon has since been refurbished and is now a youth and retreat centre run by the Redemptorists and has been renamed Scala. Meanwhile, Baddesley Clinton, once the home of ‘The Quartet,’ has been the property of the National Trust since 1980, has crawled reluctantly into the 21st century. Burke’s Irish Families, s.v. ‘Orpen’. Burke’s Peerage, various editions, s.v. ‘Chatterrton’. Dictionary of National Biography, vol 10, p 143. Frances Clarke ‘Chatterton, (Henrietta) Georgiana,’ Dictionary of Irish Biography (Cambridge: Cambridge University Press for the Royal Irish Academy). Lady Chatterton, Rambles in the South of Ireland (2 vols, 839). EH Dering, Memoirs of Georgiana, Lady Chatterton (1878). Virginia Blain, Patricia Clements, Isobel Grundy (eds), The Feminist Companion to Literature in English (1990). ‘Letters from the Coast of Clare, No VIII,’ Dublin University Magazine, September 1841, pp 336-345. Rolf Loeber and Magda Loeber, A guide to Irish fiction 1650-1900 (2006). Goddard Henry Orpen, The Orpen Family, (Frome and London: Butler & Tanner, for the author, 1930). Joyce Sugg, Ever Yours Affly: John Henry Newman and his Female Circle (Gracewing, 1996). John Sutherland, The Longman Companion to Victorian Fiction (1990). I was writing last week about the Victorian bandstands in Dun Laoghaire, Co Dublin, Bray, Co Wicklow, and Kilkee, Co Clare, and discussed how the first bathing box erected in the West Clare resort in the 1840s was known as the Lady Chatterton. It was named after the traveller and writer, Georgiana Lady Chatterton (1806-1876), later Mrs Dering, who gave the box to the town soon after her Rambles in the South of Ireland during the year 1838 was published in two volumes in 1839. The book brought the attention of Victorian travellers to Kilkee, helping to develop its appeal as a 19th century holiday resort. Lady Chatterton was born Henrietta Georgiana Marcia Lascelles Iremonger on 11 November 1806 at 24 Arlington Street, Piccadilly, London. She was the only child of Canon Lascelles Iremonger, a prebendary of Winchester Cathedral and chaplain to the House of Commons, and his wife Sarah (Gambier), a sister of the inept Admiral James Gambier (1756-1833), Lord Gambier, known as ‘Dismal Jimmy’ by the men under his command. When she was still only 17, Georgiana married an Irish landowner, Sir William Abraham Chatterton (1794-1855), 2nd Baronet, of Castlemahon, Co Cork, on 3 August 1824. Her only sister, Catherine, had already in 1805 married Walter Jones (1754-1839) of Drumsna, Co Leitrim, and Corke Abbey, Bray, Co Wicklow. He was MP for Coleraine (1798-1809), Governor of Co Leitrim (1805) and a nephew of the 1st Marquess of Waterford. The Chattertons were a large, extended landed family, and the title of baronet had been given to Sir William’s father, Sir James Chatterton (1750-1806), Keeper of the State Papers. In the first years after their marriage, Georgiana and William divided their time between Ireland, England, Italy, and Germany, mixing in literary and social circles. 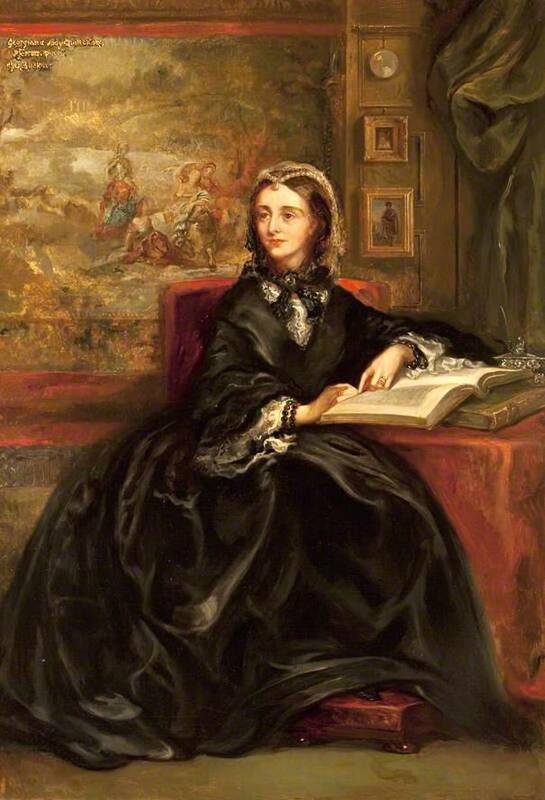 In London, she met Robert Browning, Charles Dickens and William Wordsworth, and her diary records regular meetings with the Duchess of Kent and Queen Victoria at Tunbridge Wells. Sir William appeared anonymously in Georgiana’s first book, Aunt Dorothy’s Tales, which was published in two volumes in 1837. This was followed two years later by Rambles in the South of Ireland. It was so successful that the first edition was sold out within a few weeks of publication in 1839. Her Rambles in the South of Ireland was a Victorian travelogue, vividly describing the beauty of the Irish countryside and popular scenic locations. International travel became increasingly popular during Queen Victoria’s reign, and Ireland became popular with oil painters, poets, naturalists and enthusiasts of riding, hunting and fishing. She expressed a high moral tone and an earnest desire to do good. But, while her style was well-meaning, it was non-judgmental and superficial. She was full of enthusiasm, but she knew she was writing for the growing tourism market and so did not dwell on the squalor and destitution she found. The places Lady Chatterton visited included West Cork, Killarney, Dingle, the Skellig Islands, Limerick, Castleconnell and many parts of Co Clare. She described town and country life, including the lives of the Irish peasants, but without dwelling on the realities of poverty. She wrote about ‘the interesting, intelligent, grateful Irish peasantry’ in their cottages and cabins, with rooms lined with china presses and wardrobes and bookstands filled with religious books. Lady Chatterton’s husband, Sir William, derived most of his income from his rentals in Co Cork. But the Great Famine in 1845-1851 put an end to this source of income, and the couple moved to a smaller house at Bloxworth, west of Poole, in Dorset, where they lived until 1852. 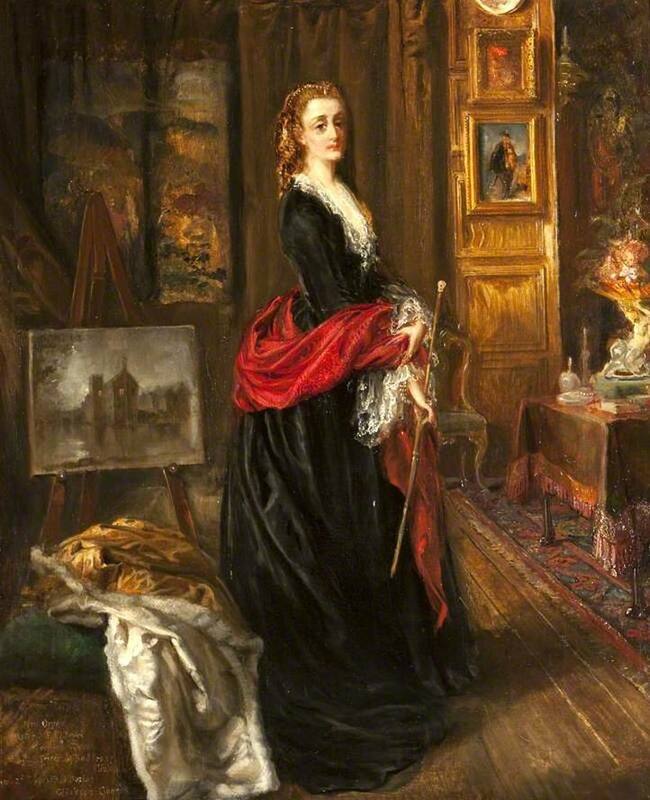 They Sir William’s young niece, Rebecca Dulcibella Orpen (1830-1923) to live with them. Her father, Dr Abraham Orpen (1779-1836) of Cork, was an illegitimate son of Major Edward Orpen (1741-1817), born 16 years before his parents married; her mother, Martha Chatterton, was Sir William’s sister. Rebecca was a six-year-old when her father died in 1836; although her mother continued to live on until 1857, Rebecca became a ward of her uncle and aunt. Her second cousins included Raymond d’Audemer Orpen (1837-1930), later Bishop of Limerick and Ardfert (1907-1921), and Arthur Herbert Orpen, father of the Irish artist Sir William Orpen (1878-1931). For William and Georgiana, Bloxworth was a retreat to a frugal existence. But there she realised from the sales of earlier books that writing could provide a financial solution to their problems. She soon became a publishing success one again. Her resolve soon paid off, and in 1852 they moved with Rebecca to Rolls Park, Chigwell, Essex, the home of the Harvey family. But Georgiana’s return to fame and her new income came too late for Sir William. He died on 5 August 1855. The family title then passed to his brother as third baronet, General Sir James Charles Chatterton. 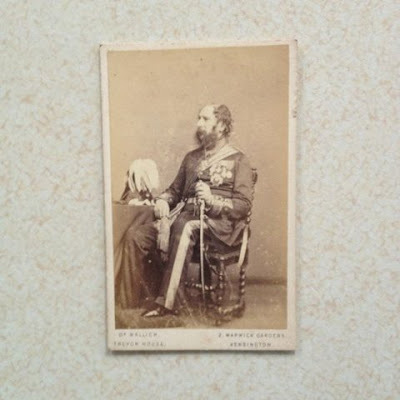 Meanwhile, in 1859, Rebecca had fallen in love with a dashing ex-Guardsman and rector’s son, Edward Heneage Dering (1827-1892), who had recently resigned his commission in the Coldstream Guards. Edward Dering was also a novelist, and was the younger son of Canon Cholmeley Edward John Dering (1790-1848), Rector of Pluckley, Kent, and a chaplain to King William IV and Queen Victoria; Canon Dering was a grandson of Sir Edward Dering, 6th Baronet (1732-1798), MP for New Romney. Rebecca was now 29, but social convention, if not the law, left Edward feeling obliged to ask formally for Georgiana’s permission to marry her niece. However, the 53-year-old widowed Lady Chatterton had a hearing impediment; she misheard the request and gladly accepted what she heard as a surprising proposal for marriage from a man almost half her age. Dering was too gallant to correct her mistake and found himself engaged to a lady old enough to be his mother. Georgiana and Edward were duly married in Saint George’s Church, Hanover Square, London, on 1 June 1859. After their marriage and against all conventions, Georgiana continued to use her former title, writing under the name of Lady Chatterton, although she was no longer entitled to the title and that her sister-in-law was now Lady Chatterton. 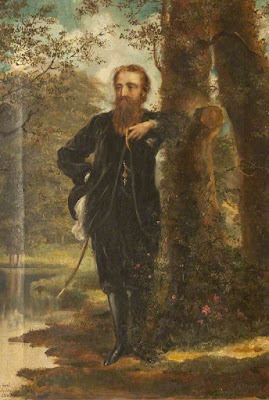 If Rebecca Orpen was initially downcast and disappointed, she soon attracted the attention of Edward Dering’s closest friend, Marmion Edward Ferrers (1813-1884), the last old squire of Baddesley Clinton Hall, a dilapidated and moated mansion between Solihull and Warwick. Rebecca and Marmion promptly married and moved into Baddesley Clinton. There she blossomed as a prolific and talented amateur artist, working in both oil and watercolour, and much of her work remains in the house to this day. Rebecca and Marmion were soon joined at the house by Georgiana and Edward. All four entered a domestic arrangement that had the neighbours gossiping. The four friends – known as ‘The Quartet’ – formed an unlikely kind of Bloomsbury Group, retiring from the world to paint portraits, write novels and wrap themselves in 17th century costumes, playing out the roles they imagined were appropriate to such a great house, revelling in art, history and religion. Within their close circle of friends, the two women had their own pet names – Georgiana was Gintle and Rebecca was Pysie. 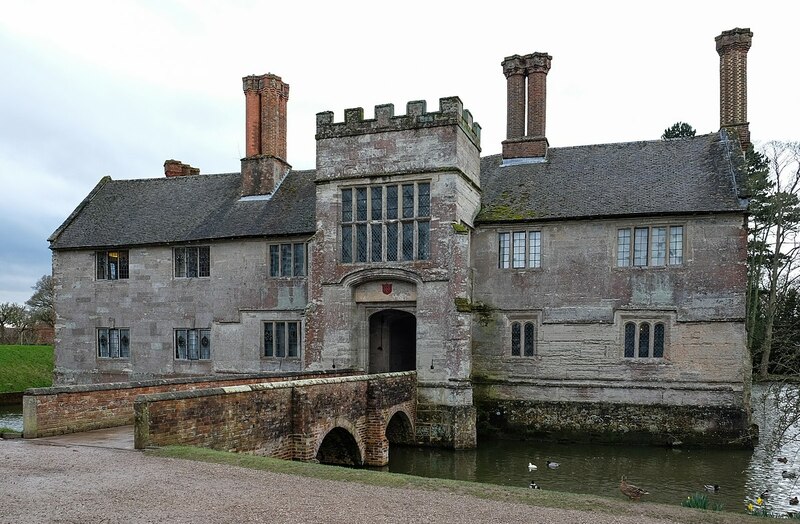 At least two Catholic martyr-saints, Robert Southwell and Nicholas Owen, had once walked the corridors of Baddesley Clinton. There the Quartet created a Catholic chapel on the first floor, with Rebecca supplying the paintings and Georgiana the leather hangings, decorated with birds and flowers. There are so many portraits of Marmion and Rebecca, Edward and Georgiana at Baddesley that the visitor might imagine they are still living there. The local vicar condemned them from the pulpit, and the Victorian equivalent of the tabloid press had a field day. But Cardinal John Henry Newman became a friend of the family and he received Edward Dering and Rebecca and Marmion Ferrers into the Roman Catholic Church in 1865. He continued to visit Baddesley, and there is a portrait of him by Rebecca in the lower landing. In an exchange of correspondence with Georgiana, Newman also shared privately his grief at the death of his lifelong friend, Ambrose St John, who had lived with Newman as his companion for 32 years. Early in 1875, Georgiana privately published a one-volume selection of works by Aristotle she had translated from the Greek, and she sent a copy to Newman. Georgiana still wavered for a while about becoming a Roman Catholic. But in the course of a lengthy correspondence with William Bernard Ullathorne, Bishop of Birmingham, on doctrinal points, including the Real Presence, receiving Communion under both kinds, the decrees of the Council of Trent, clerical celibacy and Papal infallibility, she was received into the Roman Catholic Church at the end of August 1875 by an Irish priest, Father Joseph Kelly of Warwick. ‘You will easily understand how I rejoiced to read your letter this morning. You will be rewarded abundantly, do not doubt it, for the pain, anxiety, and weariness you have gone through in arriving at the safe ground and sure home of peace where you now are. ‘I congratulate, with all my heart, the dear friends who surround you upon so happy a termination of their own anxieties and prayers. ‘May God keep you ever in the narrow way, and shield you from all those temptations and trials by which so many earnest souls are wrecked. That year, she published her final book, a translation of The Consolation of the Devout Soul (With an Appendix of The Holy Fear of God), a spiritual guide by an Italian priest Father Giuseppe Frassinetti and first published in Italian in 1852. Her correspondence with Bishop Ullathorne continued for some weeks. But she died at Malvern Wells in Worcestershire on 6 February 1876 at the age of 69. Meanwhile, thanks to Georgiana’s generosity, Marmion Ferrers had refurbished his once-crumbling mansion. He died there in 1884. Rebecca died on 12 September 1923, aged 93. All four members of ‘The Quartet’ are buried beside each other in the local churchyard. Next: Did Lady Chatterton leave a literary legacy?